West Africa is forecast to be the target of a huge surge in offshore oil/gas field investment. If plans are realized, annual expenditures of about $2 billion could grow to $10 billion by 2005, according to a new report from energy analysts Douglas-Westwood and offshore data specialists Infield Systems. "A significant increase in activity is expected off West Africa over the next decade, which could make it the world's most important offshore oil province. Within the foreseeable future, capital investment could eclipse that in 'established' regions such as the North Sea and Gulf of Mexico," said D-W author Dominic Harbinson. "Although offshore production has been underway in the shallow waters off West Africa for many years, following a remarkable series of recent deepwater exploration successes, the 2000-2005 period seems set to establish the region as a world leader in terms of offshore E&P," said Infield's Dr. Roger Knight, joint author. "Should development proceed on all currently identified prospects, the 176 fields expected onstream over the period to 2005 could boost regional liquids production by almost 3 million bpd. The leading players are Nigeria and Angola, both with some 1.2 million bpd of potential additions." Globally, over the next five years, West Africa could account for 21% of all offshore oil reserves brought onstream. This coincides with the prospect of declining output in the other major producing areas such as the shallow waters of the GOM and the North Sea. There are presently 633 fixed platforms of all types in operation in the region, plus 13 floaters and 20 storage/offloading vessels. In the next five years, the authors expect some 192 platforms to be installed, involving the drilling of more than 700 platform wells. Floating production systems are forecast to total 33 units over the next five years and these include some very large, high cost systems. For example, expenditure on the Girassol unit alone is expected to exceed $900 million. Although the proposed FPSs are mainly FPSOs, an increasing interest in Spars is evident. The large deepwater fields will require considerable numbers of subsea well completions, and an additional 297 are likely to be installed or on order by 2005, and new pipelines could total 4,000 km. TotalFinaElf dominates the West African region, holding a third of the reserve base. Exxon-Mobil, Texaco, Chevron and Shell also have substantial positions, with reserves at least four times greater than other "less-well-endowed" players. The Offshore West Africa Report is priced at UK [pound]1,825. Further details are available at: Tel: 44 1227 831879; Fax: 44 1227 832092; E-mail: admin@dw-1.com. Southeast Asia activity picking up. The Offshore International Newsletter says attractive prospects exist for operators active in Southeast Asia, and an increase in exploration and field development in the region is expected. Deepwater acreage in particular will attract oil company interest. Of the 85 mobile offshore drilling rigs deployed throughout the Asia Pacific region, 69 are under contract, putting utilization at 81%. Deepwater activity is playing an ever more important role in the region. Over half the discoveries made in greater than 2,000-ft water have been in the last two years. Since the beginning of 1999, 16 discoveries in water depths greater than 2,000 ft have been announced. From 1986 to 1999, only 10 discoveries were made in these depths. Fifty six exploratory wells have been drilled in 2,000-ft waters or greater since 1998, accounting for 62% of all known exploratory wells drilled in the area since 1980. The average water depth for Southeast Asian discoveries in the 1980s was almost 286 ft; in the 1990s--that moved upward to almost 493 ft. In the 1980s, Southeast Asia averaged just over nine discoveries per year--in the 1990s, over 35 discoveries a year have been announced. Fourteen offshore discoveries were made in the last two months throughout the region: four in Australia, four in Southeast Asia, and five in China. New U.S. Gulf developments. TotalFinaElf announced the launch of the Canyon Express subsea gas gathering project in the deepwater GOM. The project will allow development of three deepwater gas fields in the Mississippi Canyon play, 120 miles south of New Orleans--Aconcaugua (TotalFinaElf with 50%); Kings Peak (100% BP); and Camden Hills (TotalFinaElf 16.67%). The partners in Aconcagua will own 45% of the TFE-operated Canyon Express system, while BP will own 35% and Camden Hills partners 20%. The system will be laid in water depths of 300 to 7,200 ft and comprise a dual 12-in., 55-mi pipeline with 500 MMcfd capacity. The structure will gather gas from the three fields and carry it to the new Canyon Station processing platform operated by Williams in Block MP 261,55 mi north of Camden Hills. The line will be laid in 2001, and the system will come onstream in mid-2002, the same time as the three fields. Heerema Marine Contractors announced that it has been selected by BP for installation of facilities, associated pipelines and gathering lines in deep water, up to 6,600 ft. HMC will provide deepwater construction services for development of BP's Crazy Horse, Mad Dog, Holstein and Atlantis fields. The installation agreement calls for use of two HMC vessels, the Deepwater Construction Vessel Balder and DCV Thialf. Over the next several years, the work is expected to bring as much as $400 million in revenues to HMC. In support of the commitment to deep water, HMC is currently converting the semisub crane vessel Balder into a DP DCV. This conversion will be finished by the end of 2001. Balder will then directly leave for the GOM and the BP projects. 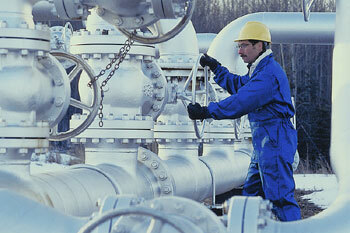 For deepwater pipeline installation, HMC has started design/construction of its second J-lay system. This system has sufficient capacity to install all typical deepwater infield flowlines and export lines. Its deepwater equipment pool includes the DCV Thialf which is being upgraded to be used either as back-up, or for the execution of several deepwater projects at the same time.